Designed specifically for preschool through elementary grades, Tangoes Jr. includes 7 large magnetic puzzle pieces, 12 double-sided puzzle cards offering two levels of play and a large playing surface. All pieces and cards store in unique plastic carrying case. Tangram Smart is a fast-paced tangram-matching game that makes solving this cheerfully challenging centuries-old puzzler a joy. Fit colorful triangles, parallelograms and squares together to form hundred of shapes: traditional to whimsical, simple to complex. Animals, letter numbers, people and everyday objects are just some of the things you will find in out 45-0bject flipchart booklet. Puzzle fun and plane geometry are fearlessly forthright in this ancient Chinese game of congruence, similarity, and transformations. With English, Spanish, French and Chinese terms provided for each object, Tangram Smart is a game that will collect no dust, and is great for everyone! 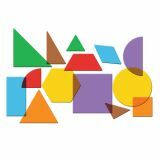 Our updated Tangram Smart Kit with CD includes 200+ pages of worksheets, lessons, activities, and more! 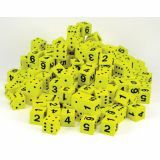 Build basic math skills the old-fashioned way! These step-by-step activity pages are perfect for the student who needs plenty of practice to reach mastery levels. Students love racing the clock to show their knowledge, building skills and accuracy as they go. Validate students' achievement with the reproducible award certificates, and use the progress charts to track development. 100 facts per page! 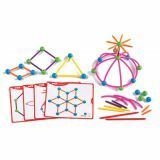 This large set is great for engaging children in composing 2-D shapes! Pieces are relational and translucent so the creative opportunities are endless! Set of 408 pieces includes 14 different shapes in 7 colors (2 different squares, rectangle, 5 different triangles, hexagon, trapezoid, rhombus, circle, half-circle, quarter circle). All shapes support CCSS for K–2 and can be used with younger children for endless activities, including creative play with the glo-Pane™ Ultra-Slim Light Panel (LER 4422). Largest piece measures 2" x 2".